Home » ANHE News » Beth Schenk Wins the Charlotte Brody Award! Beth Schenk Wins the Charlotte Brody Award! 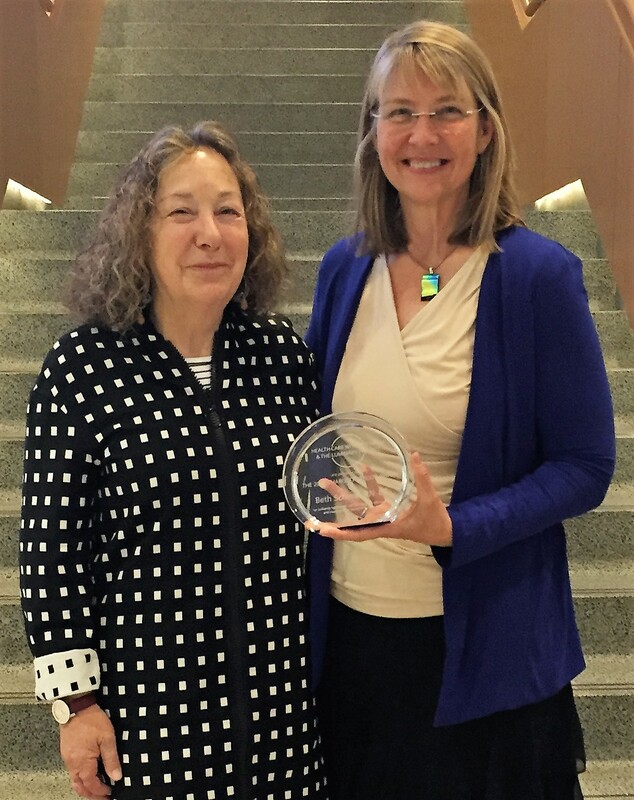 We are so proud that ANHE Practice Work Group Chair, Beth Schenk, has won the 2017 Charlotte Brody Award. She has been a true leader in environmental health nursing! Below are her acceptance remarks. Congratulations, Beth!!!! Clean Med Conference. Minneapolis, Minnesota. I’m very happy to be here, but I notice something…At Clean Med, I get agitated. Do you? (so much to be done, so many ideas…and we need to do it now). Some years ago at Clean Med, when we had the research oriented pre-conferences, I said to myself, someone has got to study nurses. Nurses are everywhere in healthcare. Why isn’t someone studying nurses’ roles in healthcare pollution? Then I felt the proverbial thump on the head and a sense of dread…oh no…me? In other words, I got agitated, the meeting was in May, and by August of that year I was enrolled in the PhD program at Washington State. That led to development of the instrument you heard about, the Nurses Environmental Awareness Tool, and interactions with hundreds if not thousands of nurses, to learn about their perceptions of the environmental impacts of their work and what they do about it. Today, I have a request of you. And since this award is about nursing, my request is about nurses. This is not to discount the wonderful professions and individuals who contribute to this work, including my fine colleagues at Providence St. Joseph Health. (Go ACES!) But it is to enlist you all in an opportunity. First…nurses are everywhere. In hospitals, nurses make up 30-40% of the workforce, and 30-40% of the payroll. For instance in Providence St. Joseph, we have 106,000 caregivers(employees) and 40,000 of them are nurses. There are 3.3 million RNs in the nation…one of every hundred Americans is a nurse. Nurses are everywhere…in your family, community, workplace, churches….everywhere. Second, Nurses have been ranked as most trusted profession every year since Gallup began asking that question except for one…2001, when the firefighters were named. But, every year before and since…it has been nurses. Nurses talk to patients, to family and friends, to students, executives, to board members. Our voice is trusted, and our opinion is sought… People ask nurses for the real story-often behind the scenes. And, as evidenced by Gallup, people trust what nurses say. Third, Nurses are professionally obligated to address the environmental impacts of their practice. ANA scope and standards of practice are among our professional guidance documents…they identify our professional obligations and how we know if we are meeting them. For instance…we respect the dignity of the individual, we use evidence to support our practice, we are first and foremost patient advocates. It’s a terrific set of guidelines. Since 2010, we have had a standard that states “The Registered Nurse practices in an environmentally safe and healthy manner.” One implication of this is that nursing practice should not pollute, and that we, as nurses, are responsible for the pollution of our practice. With these three basic elements…nurses are everywhere, nurses are trusted, and nurses are professionally obligated to reduce environmental harm, we have all the ingredients of a fine recipe. What we need now is to cook. That takes some heat, and probably a little stirring. I said earlier that when I come to Clean Med I get agitated. This year too. I’m agitated again. It’s not altogether pleasant. And I said that I have a request of you. My request to you is to help us cook. Vendors…please consider pitching your nursing specific products at large nursing conferences, such as Magnet, AONE, AORN, NTI. Some of you do, I have seen you there. On your signs, consider “Reduce Pollution” or “The Registered Nurse practices in an environmentally safe and healthy manner.” Catch their attention through a different lens. You see, not all nurses know we have that standard, that obligation. You can help them connect the dots. Leaders…if you are here, you are interested in cleaning up healthcare’s act. You could do it without 40% of your workforce, but I don’t know why you’d want to. So, please take these ideas to your CNOs, shared governance councils, quality teams, risk and safety, unions and bargaining units. Ask them to help solve your pollution problems. Help secure time and resources to do so. Other clinician colleagues. If you are working on this, you are already working with nurses. Terrific, and onward! Let’s go together! Facilities, food and nutrition, EVS and other team members…work with all clinicians to constantly identify and share the health message-that doing this work saves lives. The health message can get lost, and yet we know that the health message resonates with everyone. We need to measure and report it more effectively. Lastly, our leadership organizations (HCWH, PGH, ANHE, CHA)…help turn these ingredients into a fine meal. Let’s re-set, re-think, re-new, and re-imagine effective methods for mixing these ingredients of the largest and most trusted profession in healthcare, with it’s professional obligation for environmental health and safety, all served on a bed of care and compassion…to answer the urgency of this work, as we care today for the patients, families and communities of tomorrow.